Well this is not a bicycle or bike component, but it is something that is similar in terms of function and usage. A while ago, I bought a normal kick scooter (Oxelo Town 7 XL), just to test it out and see whether it fits my usage or not. 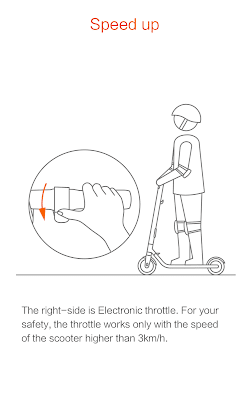 Although it is a nice kick scooter with full suspension and a rear brake that is hand operated, I found that having to repeatedly bend the knees to push off against the ground is not ergonomic or comfortable at all. On uphills, riding a kick scooter feels more tiring that just walking. On downhills it is fun, but most of the time it is used on flat ground. As the Oxelo Town 7 XL was under-utilized, I sold it away. I also had a Carry Me, but it was also hardly used. A Carry Me excels in having a very small folded size, but the ride quality is way poorer than my other bikes. If I was going from Point A to B, I would just ride any of my other bikes, depending on the route. If I'm riding on road, I would just take my road bike or folding bike. If I'm riding on the pavement, a folding bike is sufficient. There is actually no benefit for me to use the Carry Me instead of my Dahon MuEX which rides so much better. Folding and unfolding the Carry Me is also a hassle for me as I always have to retighten and realign the seatpost and handlepost. That is why I also sold away the Carry Me as I almost never used it. I found that sometimes, I want to get from Point A to Point B, but without bringing along a bicycle (which can be quite big) or exerting too much effort. For example, when going to the food centre to take away some food, or to run some errands, a bicycle may not be so suitable. In my case, whenever I cycle, I have to shower after that as I will sweat easily. In this case, an e-scooter is actually more useful, as it can be folded to a very small size (smaller than a Dahon). As it is motorized, getting to the destination is also effortless. This means that I can arrive at my destination in more formal attire, without working up a sweat from cycling. It is another form of transport that is different from cycling. As there are some rules regarding e-scooter usage in Singapore, I needed to get one that is certified, or it will become illegal once the grace period is up. Basically, it needs to weigh less than 20 kg, with a max handlebar width of 700mm, have a top speed limited to 25km/h, and also be UL2272 certified. Lastly, it should look sleek and high tech, and not like the loud and heavily modded illegal e-scooters. 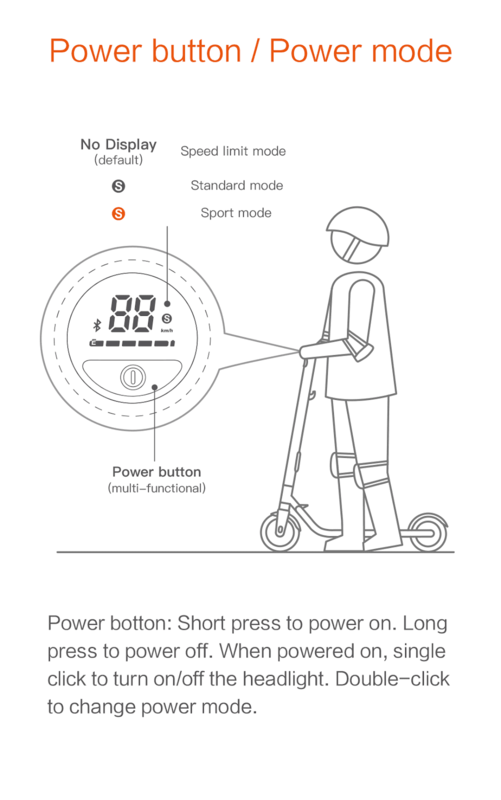 One of the nicest looking one that I have seen is the Ninebot by Segway ES2 E-Scooter, which is what I eventually bought. Being one of the biggest e-scooter manufacturers in the world, it is also the manufacturer of the popular Xiaomi M365 e-scooter. Not only that, this company also supplies rental e-scooters to Bird and Lime, two of the biggest shared e-scooter companies in the US. Let's take a closer look at the ES2 e-scooter and see what makes it so attractive! Overall view of the ES2. Clean appearance with no unsightly wires snaking all over the place. Battery is stored inside the large diameter handlepost, which is less common as most other e-scooters have the batteries under the floorboard as it keeps the weight low and stable. Clean handlebar, with a round display in the middle, and the switches and grips at both ends. Handlebar is 420mm wide. The ES2 has 3 power modes, which is the speed limited mode, the standard mode and the sport mode. The differences are the level of acceleration (power available) and also the top speed. 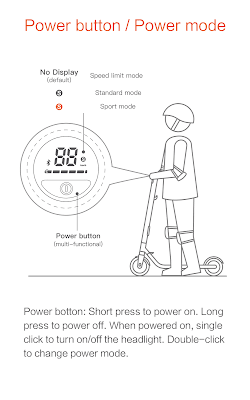 It is recommended to start with the lower power mode first, to get used to riding the e-scooter. The higher power modes should only be used when you are more experienced. To switch between the power modes, double press the power button which is located beside the display. In speed limited mode, no "S" is shown. Top speed is 15km/h while the acceleration is slow. Best recommended for beginners or kids. In standard mode (white "S"), the top speed is 20km/h, while the acceleration is stronger than limited mode. Good for cautious riding as the acceleration is smooth but not too strong. Sport Mode (or Type R mode as I call it) with red "S". Top speed of 25km/h (regulated by law), with strong acceleration. This is the mode that I use, as the strong acceleration is useful for moving off. Also needed if you are going up a slight incline. Braking is activated by pushing the brake lever on the left side of the handlebar. The more you push, the stronger the deceleration. Electronic modulation is quite good, while the regenerative braking is surprisingly powerful. Throttle lever is on the right side. Push more for a stronger acceleration. Modulation is quite good as I can control the acceleration smoothly, without an on/off feel or a jerky movement. Push the throttle all the way and the ES2 accelerates strongly! If you ever need to loosen the throttle unit, the bolt is hidden at the bottom, inside a small hole. For your safety, the throttle will only activate when the moving speed is more than 3km/h. This prevents accidental activation when you accidentally touch the throttle lever when stopped. 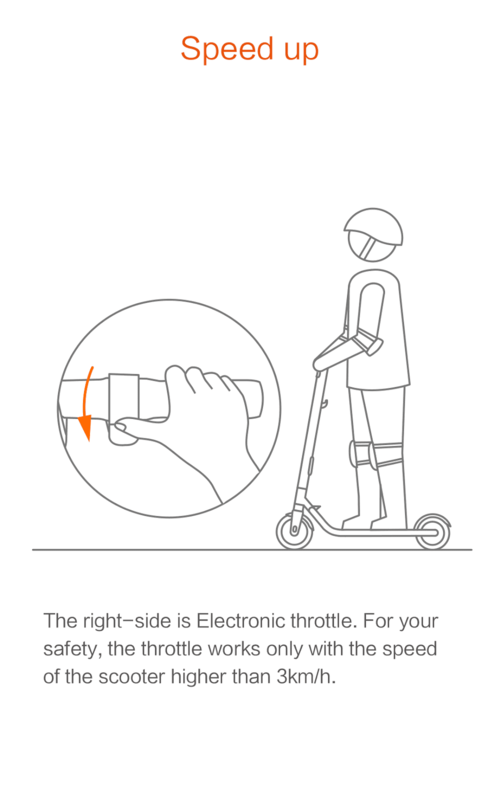 Also, this means that you need to kick off to get the e-scooter moving, before you press the throttle to activate the motor. Pressing of the throttle lever with the thumb. Keep it pressed to keep moving. I took out the rubber grip to see if the throttle angle can be adjusted, and found that the handlebar actually has a keyslot. This keyslot is for the wires to route internally from the throttle and brake levers to the central computer, and also means that the throttle position is fixed. The rubber grip has a corresponding shape to prevent grip rotation when mounted on the handlebar. Clever design! That said, you can probably use a standard bicycle rubber grip or lock on grip on the ES2 handlebar. Handlebar measures about 22.2mm in diameter, which is the same standard as bicycle flat handlebars. Grip length is about 110mm, slightly shorter than bicycle grip lengths. The throttle position cannot be moved, so if you replace the grip, it needs to be about the same length. Another look at the display and power button. Looks neat and tidy! Brand name printed clearly on the handlepost. Charging port located on the handlepost. This is also where you can attach an additional battery (for additional range and power) if needed. Charging port with a rubber cover. The rubber cover does not fit really well, as it tends to detach on its own, exposing the charging port. Take note if you ride in the rain (not recommended). I got my ES2 from Mighty Velo in Singapore, which is now the official distributor of Segway Ninebot products. At the time when I bought it, the ES2 was on sale (it is always on sale) at $599. With a $60 Black Friday coupon from Qoo10, the final price was just $539! I basically went to the shop, bought it using the Qoo10 app and voucher on my phone, and collected it from the shop! Not only is the price quite attractive, it is also covered by warranty for up to one year, since it is bought from the distributor and not other online websites (where the price can be a bit cheaper still). Actual weight is 12.4kg, which is the same as what is claimed by the manufacturer. This makes the ES2 heavier than any of my other bicycles! In the next two posts, I shall elaborate more on the other parts of the ES2 e-scooter, such as the suspension, the lights, and the folding mechanism. You can probably use the shorter Rohloff/GripShift versions of Ergon's grips on this as they're about 100 mm long.